Dec 20th. Leaving the lodge early, we descended back down the by now quite muddy track and eventually found our way back to the main road and the waiting minivan. The drive back to Cagyan de Oro was as dangerous as it was the other day, but we made it most of the way there before stopping to stay goodbye to Jim. He was leaving us at this point to go back to the USA, leaving just myself and Tim to carry on with Bram for the rest of the trip. First on the agenda was the small volcanic island of Camiguin Sur, a few miles off the north coast of Mindanao. The ferry was incredibly slow, and the journey was pretty birdless, but we did see a few flying fish. Ninety minutes later we arrived on Camiguin and were greeted by our driver; the ever smiling and laughing Ping. 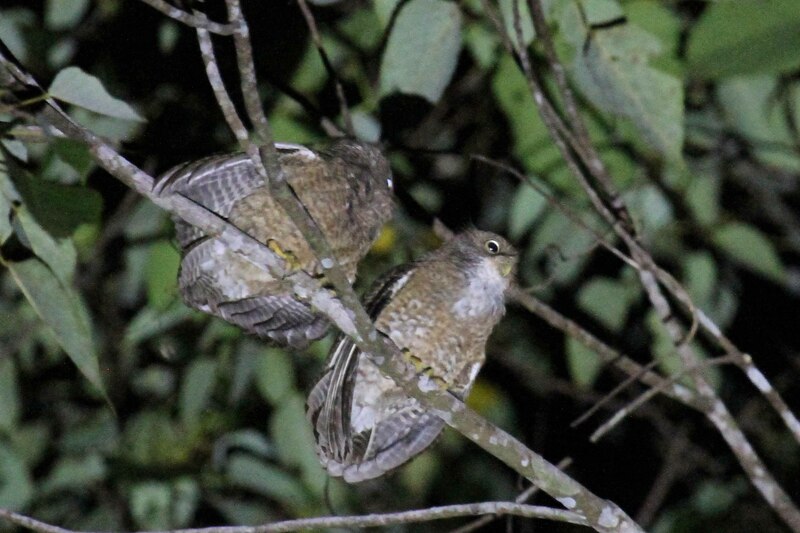 Camiguin Sur is an island that is not on the regular birding circuit, which is a shame as parts of it are delightful, and it currently has one endemic bird, the imaginatively named Camiguin Hawk Owl. 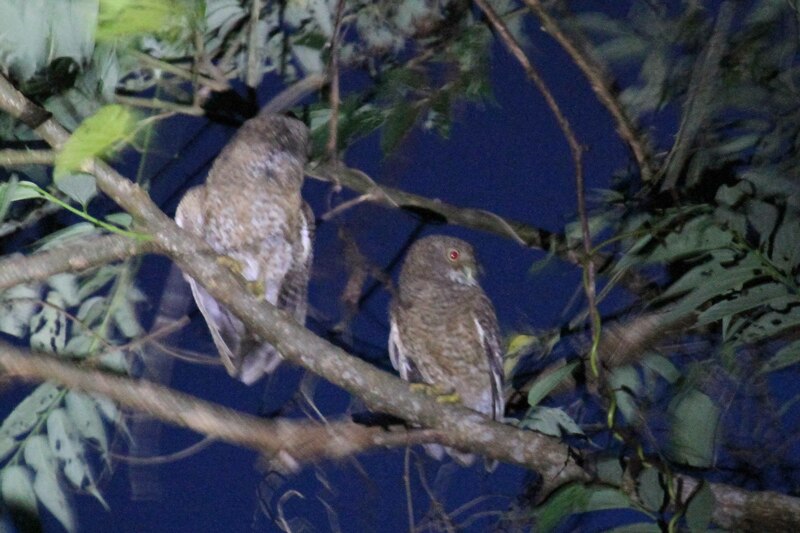 This is one of the recent splits from Philippine Hawk Owl, and as far as we could gather, has probably been seen by less than twenty western birders. So a bit of a blocker then. After checking into our hotel, we took the narrow road up into the mountain area and then walked a bit further along a gravel track that will probably be a tarmacked road by now. 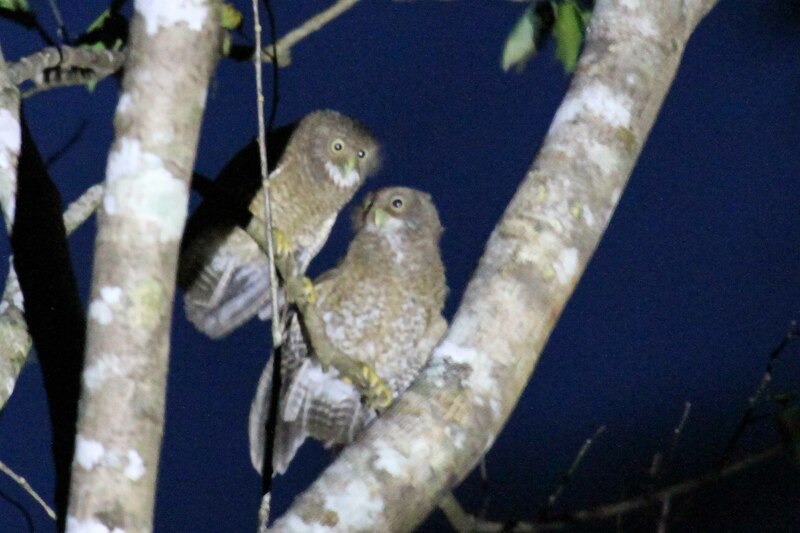 As soon as dusk fell, two pairs of owls started calling, a strange gibbon-like hooting that was given in duet. One of the pairs responded to our tape immediately and flew straight in to us, looking down on us with their strange yellow eyes that look blue in camera flash. The pair bond is clearly very strong with these birds. As soon as one bird flew to another perch, the other followed. There was lots of mutual preening, and they both held their wings in a semi-permanent drooping position. It was very odd, and contributed to the rather “loose” appearance of their entire plumage. Dawn was a few hour away when we rose on the 21st, and or plan to grab an early morning coffee and bun at a local store was put in severe jeopardy by the faithful masses that had just come out of church and flooded the streets. With queues at the shops tens deep, we decided that if you can’t beat them, join them. So we went to the church and partook of the coffee and cake on offer there. I have no idea why the people didn’t do this, but it worked out well for us. We then investigated the mountain road again, picking up several new species despite the low cloud and rain. 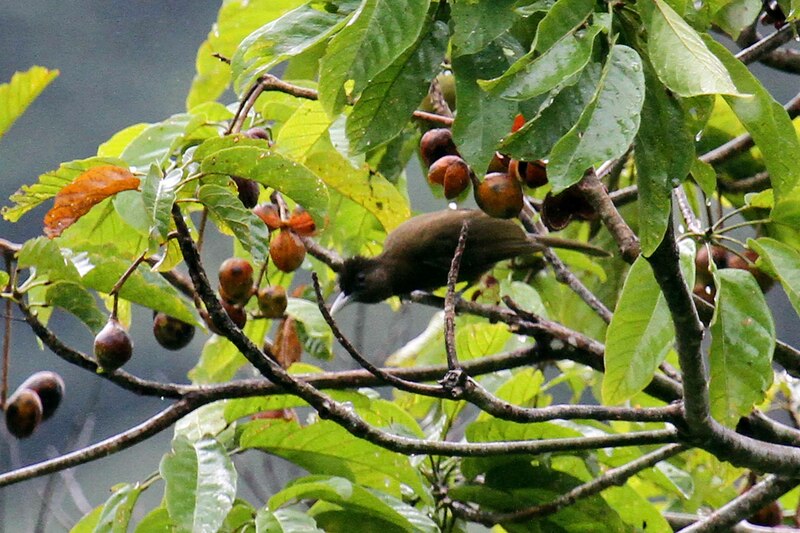 The endemic Camiguin race of Yellowish Bulbul looks slightly different and sounds totally different to birds on Mindanao. A potential split in future perhaps? 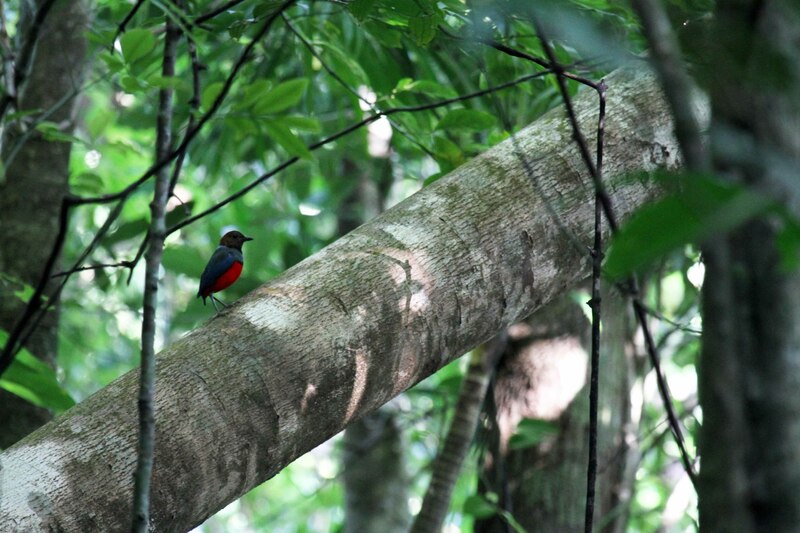 Also racially endemic here were the Black-naped Monach’s, distinctive in being a brighter blue and lacking a black nape. A couple of Rufous Paradise Flycatchers, some Everett’s White-eyes and a pair of Mangrove Blue Flycatchers of the Philippine endemic race. These are pretty different to the Mangrove Blues elsewhere apparently, but as with many other Philippine endemic races, it’s yet to be split. We left the mountain and went to a nearby hot springs resort to try for Variable Dwarf Kingfisher. I really like kingfishers, and was hoping to see all the Philippine endemic species. 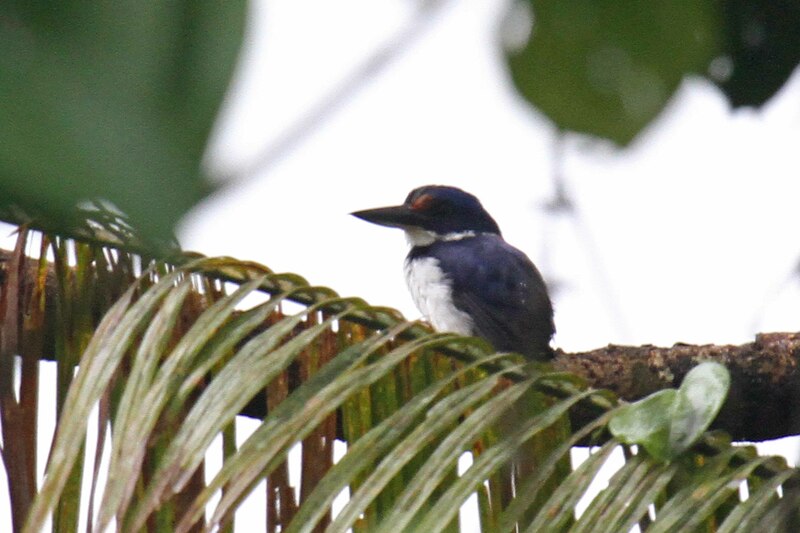 The Philippine race of Variable was well worth seeing as it’s now been split by HBW as Dimorphic Dwarf Kingfisher, and the birds on Camiguin Sur are among the easiest to find. Except today. 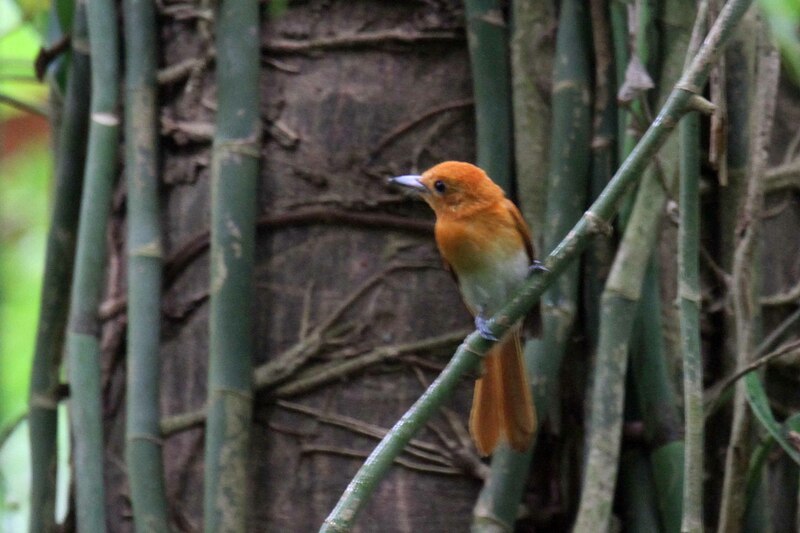 We left the site with not a sniff of the kingfisher, but some nice views of Rufous Paradise Flycatcher. After a much needed afternoon siesta, we went back up the mountain road and treated ourselves to more views of the Camiguin Hawk Owls. Leaving at 5am, we picked up coffee on the way to the now cloudless and dry mountain. Bird activity was high, and we immediately heard two Red-bellied Pittas calling. I have a slightly chequered history with Pittas. In Thailand, I dipped on Blue, Eared, Mangrove and Malayan Banded, but did eventually see Gurney’s. 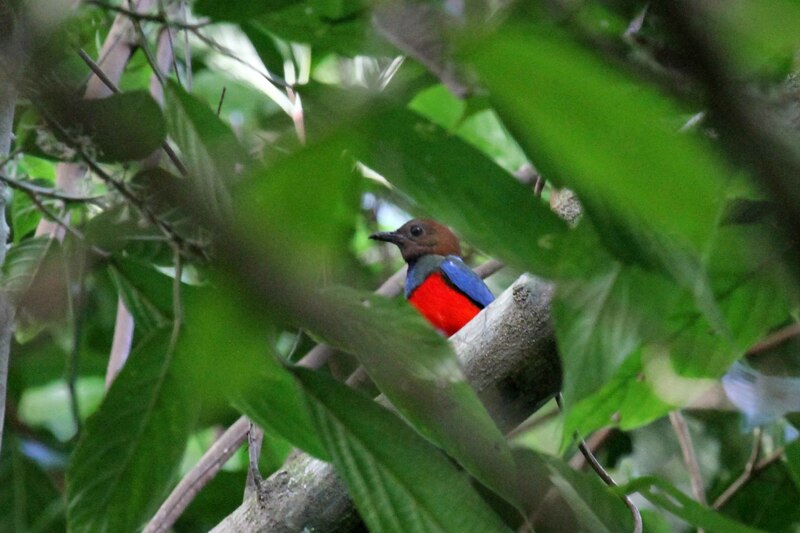 So far on Philippines we’d spent two days searching for Azure-breasted before finally seeing one, so when a Red-bellied Pitta started calling from along a dry riverbed, I had visions of hours spent crawling up and down gullies chasing a ghost through the undergrowth. This one was too be different though. Thankfully we found it pretty quickly, calling from dense understorey. It performed nicely and gave us some great views. I’d always been a bit nonplussed by the prospect of Red-bellied Pitta. In a family of jewels, this species always seemed to me to be a bit of a damp squib. I was wrong. The red belly was lit as if by an internal flame, an avian Silmaril, a glowing red that I’ve never seen the like of before, shining out from the dark understorey. It put on a great show for us over the next 30 minutes or so, and we also availed ourselves again of the other forest birds that we had seen the previous day. We also scored with another potentially tricky endemic kingfisher; the Rufous-lored (or Winchell’s) Kingfisher. After this show, we went back to the Ardent hot springs and got lucky with the Dimorphic Dwarf Kingfisher. It was quick, but it was there! 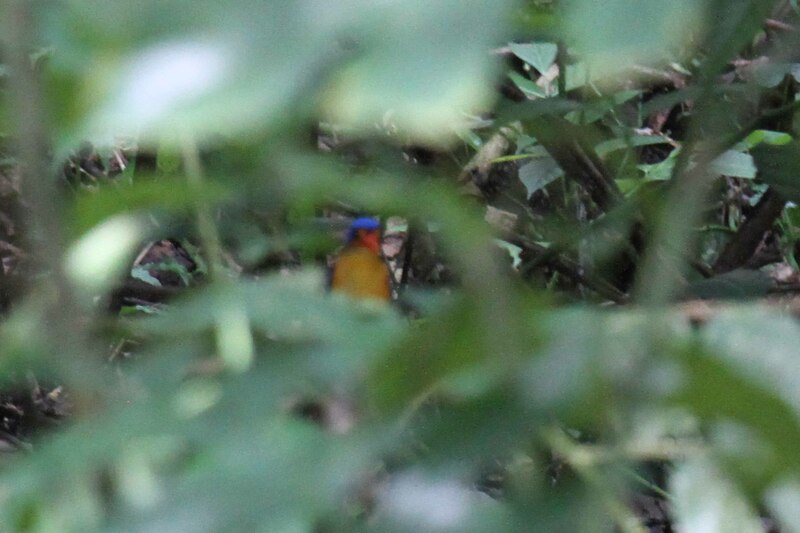 Dimorphic Dwarf Kingfisher – truly awful picture! Then it was time for a burger and an afternoon of rest. Camiguin had pretty much delivered. The observant among you might notice that I haven’t mentioned the Camiguin Hanging Parrot (Camiguin Colasisi). This is because we didn’t see one. Apparently they are pretty difficult after suffering heavily at the hands of trappers for the cage bird trade, plus they are usually found at higher altitudes than we managed, involving a decent trek. We couldn’t really be bothered, not for a bird that is not split by everyone and seems likely to be lumped as a race of the (pretty variable and widespread) Colasisi. The following day was a long travel day, and my first day of the trip without a lifer. After getting back to the mainland of Mindanao, we were picked up in a minivan again and driven at breakneck speed to the town of Bislig near the east coast. The phrase “near-miss” is pretty much redundant, as we basically spent the entire journey in a state of near misses with a couple of real close calls. Still, you do tend to get used to this style of driving when abroad. This entry was posted in Asia, Philippines, Travel, World birding and tagged Camiguin Boobook, Camiguin Hawk Owl, Camiguin Sur, Dimorphic Dwarf Kingfisher, Yellowish Bulbul by Paul French. Bookmark the permalink.